Patrik Lindström Electro, Synthpop Stefan Poiss was a busy man last year. First he released the epic 'Revelations' with mind.in.a.box and then he released the almost as epic 'The Way Home' which was the debut album for his side project THYX. 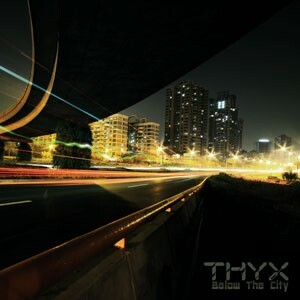 As far as I know now, there's no planned mind.in.a.box album for 2013, but we have a brand new THYX album called 'Below The City'. One can claim that there's no big difference between mind.in.a.box and THYX, and I'm willing to agree with that, especially if you compare it with 'Revelations'. However, THYX generally does not have the same story driven albums as mind.in.a.box, THYX actually uses some guitars and also, there's generally a whole lot more vocoders in mind.in.a.box. I really don't care that much, I'm just happy to get more from Stefan Poiss more often, whatever name it is under. Happy to report, THYX deliver yet another great album. Stefan Poiss has so far never released a bad, or even mediocre album so far, and he is not ready to break that winning streak just yet. While the heavy and fast paced first track "Searching" will not go down in history as his best tracks, the second track "The Endless Journey" is quite a gem with its amazing chorus. This is an album that is 10 tracks strong, and then I mean strong. There's not a single bad track on this album, and I would have liked to mention something from each and every track, but then it would just be the complete track list of the album. However, I really need to mention my two favourite tracks part from "The Endless Journey". "Alien Love" starts out very slow, blue and downsized. And for each passing verse, it expands, explodes with small fragments of new sounds. In the middle of the song, the drums comes for the first time, and it continues like this, forever adding, until it finally is in full bloom 3 minutes and 12 seconds into the track. And the final minute breaks my heart, it's simply that beautiful. And before you are able to get back on your feet, "Roses" slaps you around the face with a large beat (if I would look as cool as I feel when I listen to this track while driving, I would be one happy man). Once again, Stefan really nails it with the chorus. Stefan Poiss was a busy man last year. First he released the epic 'Revelations' with mind.in.a.box and then he released the almost as epic 'The Way Home' which was the debut album for his side project THYX. As far as I know now, there's no planned mind.in.a.box album for 2013, but we have a brand new THYX album called 'Below The City'. The chorus for "Roses" goes a little something like this; "Dreams and plans, comes crashing down, but the fact remains that we are still around...". I want to finish of this review by saying that with THYX's new album 'Below The City', there's nothing that comes crashing down, from the start to here, it's up, up and away.